I'd like parents to use something like the scientific method when it comes to raising teens: experiment, collect data, review the results and make tweaks. When my son was a hell-on-wheels toddler I attended a parenting workshop on disciplining strong-willed children, led by Michael Simon, founder of www.PracticalHelpForParents.com. As Simon waved goodbye on the last day of class, he gave us our final pep talk and said , "See ya when you have a teenager!" I laughed and thought to myself, I'm not coming back. What could possibly be harder than dealing with a two-year-old? Why the title? Explain what an approximate parent is. If parenting was easy -- just a matter of following principles, like an object follows the laws of motion -- you'd just pick the "best" parenting style and follow it. But you cannot do that because choices around parenting are always case specific. Good choices around parenting are only "good" because they fit you and your teenager. One size can't fit all. If you're engaged as a parent, you're coming up against limitations and losses and you have to adapt. You can't make life perfect for your children. The world of humans in families is such that you can't actually even know what is perfect for your child. Even if you're a caring, loving person, you can't really know in advance what your child will need. In parenting, a good approximation is something that we realize after the fact.That's ultimately true for teens, too -- they have to try things out and then they figure out better ways to do it. That's not a "problem" -- that's in the nature of their development and it's in the nature of parenting. Being an "approximate parent" means going beyond the idea of trying to do it all "right" or figure out the right thing in advance. I'd like parents to use something like the scientific method: you do an experiment and then you collect data, review the results and make tweaks. That's a process ofapproximation. Your children want to see and feel you engaged in this process of figuring things out -- it makes them feel respected and worthy in the light of your efforts. It lets them know you love them. Being an approximate parent means forgetting about getting the perfect answer and approximating a good enough answer for a specific time for your particular child. Explain the growth of the prefrontal cortex and why parents might be a bit more compassionate if they understood that their teen's brain is still under construction. Your teenager's brain is not fully developed and won't be until say 24, 25 or so, depending upon your child's environment and genetic inheritance. But some important structures of the brain, like the dorsolateral prefrontal cortex (DLPC) fully develop last, according to a back to front principle of brain development. Unfortunately, the relative immaturity of the DLPC is at least partly responsible for things like increased risk-taking, poor decision making, poor advance planning, difficulty in managing and understanding one's own emotions and the emotions of others. Your teenagers look kind of like adults, but they think, feel and process experiences in very different ways. They don't have many of the fully-developed capacities that you have like good perspective-taking and the ability to see the big picture and delay gratification. If you add in the enormous changes their bodies are experiencing, the pressures of social problems like racism, sexism, homophobia and the challenges of pleasing one's parents, teachers and friends while remaining true to yourself and actually trying to remember what you learned in 3rd period biology, maybe you begin to have some compassion for your kids. Your teenager's life with an undeveloped prefrontal cortex is a bit like having a Formula One Race car in the hands of a 6-year-old. Photo credit: Annie Spiegelman Trouble brewing . . .
Any tips for parents of teens and the challenges of the internet, gaming and social media? First of all you have to know your teen. Does your teen have trouble transitioning from activity to activity and tend to get "stuck" and intensely involved in activities in general? Is your teen a risk-taker? Does your teen have limited interests and friendships or does he or she have many different activities, from using social media and texting to playing sports, hiking, making art, volunteering with kids or older adults, etc? If your particular teen tends to get locked into things and take risks often and impulsively and is focused on the use of these digital media, you'll want to keep close tabs on their usage. Digital media is ever-present and incredibly attractive to teen brains -- especially teen brains that register novelty, risk-taking and the feeling of connection as highly pleasurable. The Internet, gaming and use of social media can, in my view, become addicting. This is a complex question but first and foremost, try to know what your kids are doing with digital media and try to become literate in digital media yourself. You have a whole chapter on teen mental health. Explain. It's not as boring as it sounds. In fact, when people think about mental health they generally think about mental illness. I'm intensely interested in mental health -- what constitutes a healthy teenager. If a parent says, "my teen doesn't have depression or anxiety and she's got a 3.8 GPA and lots of friends," it does not mean that teen is mentally healthy. Sorry, I know it's a shameless plug, but you really have to read the book to find out what constitutes mental health for a teenager. I think its really crucial for parents to be able to know the signs of mental wellness as well as to be able to spot signs and signals of challenges around mental illness. Teens, drugs and parties. Every parent's nightmare. Can you give some tips? 1) Observe your teenager's sleep, eating and mood patterns. If one or more of those things change for a while, it's a red flag to pay more attention. 2) Know that drug use makes sense for teens. Your teen won't try alcohol or drugs at a party because he or she is deviant, but rather because it is part of normative adolescent risk-taking in the United States. 3) Think of the reasons for why adults use drugs and alcohol -- those will be the same reasons teens do it. 5) Talk, talk, talk (or rather, listen, listen, listen). Every study I've read demonstrates that the most important factor in reducing the harm associated with partying, drugs and alcohol use is being a parent that talks about these things, openly and calmly. Not huge "big talks," but lots and lots of little talks that demonstrate this to your teenager: In our family, we talk about the hard stuff and I try to listen, not lecture. Through all the research you've done over the years to understand teenagers, you still come across LIKING teens! This is pivotal, since many concerned parents reading your book may have temporarily lost control of their emotions over a lie, messy room or a slammed door. You keep coming back to how adults can support their teens while setting limits; making us all better parents and role models. What's the key? The key is there is no magic key. 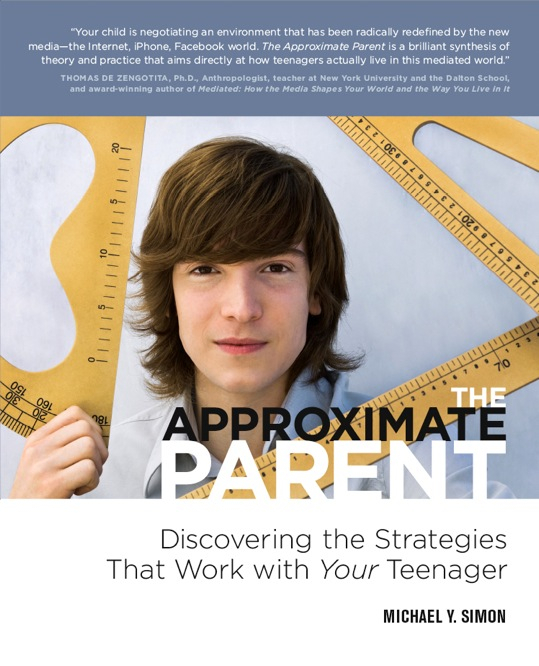 The "approximate parent" isn't just some clever catchphrase made up just to sell books. Approximating answers to a process as difficult and ongoing as parenting is, in my view, a great approach to working with teens. I know you love even your screaming teen, but if loving our children was enough, we wouldn't need someone else's book on parenting. It's all about strategizing how to best demonstrate your love to your child. The answer for how to do that in any given moment will depend upon each new situation, as it arises, and knowing something about your teen's physical and emotional state, your physical and emotional state your level of knowledge about the particular problem and a variety of other factors. The book is about showing parents what factors could be considered to arrive at a good strategy for intervening. Then you have to try your strategy, gather data and see what worked, and try again. You will need the help of others along the way. But doing that kind of approximating and trying, day in and day out, assessing the results and having a go at it again -- that's not just perseverance; that's love. To pre-order the book go to: www.theapproximateparent.com. Follow Michael on Twitter @theapproxparent for tweets about The Approximate Parent or @supportingteens for ongoing information and links about supporting the teens in your life--whether you're a parent, educator, mental health professional or friend to a teen!